Concrete Power Screed Rental – Gas – Allen Concrete Equipment HD7070, is available for rent in Rochester NY, Ithaca NY and the entire Western New York region from the Duke Company. 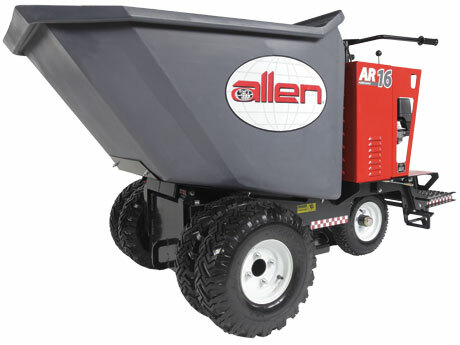 The rental Allen Engineering AR16 power buggy available for rent, is capable of carrying 16 cubic feet of concrete. The tank is made of two-inch, solid steel, enabling productivity and durability. Rugged tires enable traction in tough operating conditions across the job site. Features include: heavy duty poly dump bucket, hydraulic dump action, solid 2″ thick steel frame, 16 cubic foot bucket capacity, dual front tires for extra load capacity and traction, easy to use operator controls, speed control lever, ventilated engine shroud, forklift pockets, gasoline powered engine, foot-operated dumping control.